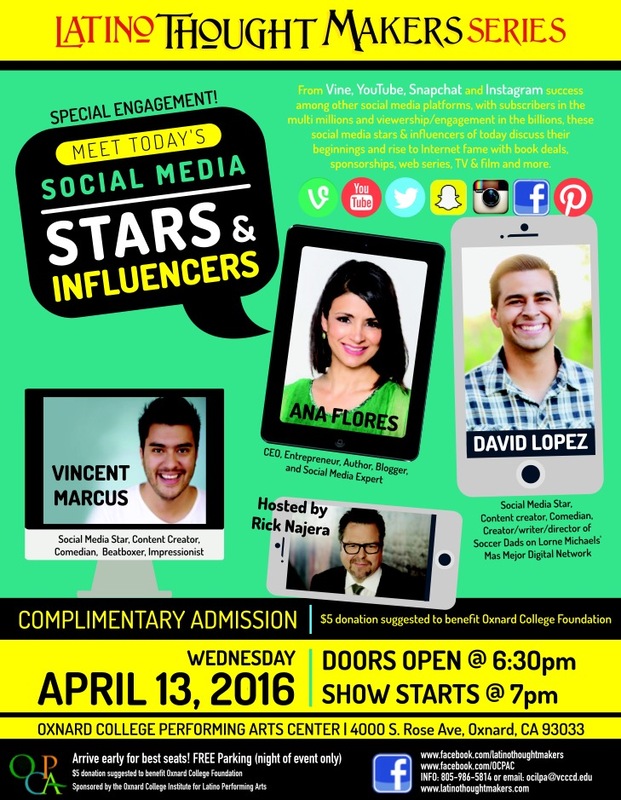 OXNARD, CA – March 21, 2016 – The Oxnard College Institute for Performing Arts presents the next installment of Latino Thought Makers featuring social media stars and influencers: Vincent Marcus, Ana Flores and David Lopez . The popular live series platform, hosted by comedian and award-winning writer-director-author Rick Najera, will take place on Wednesday, April 13, 2016 at Oxnard College‘s Performing Arts Center at 7pm. The social media experts will discuss their insight of the current social media state of affairs. Vincent Marcus is a social media star, comedian, beatboxer and impressionist. A gifted musician and comedian, Vincent will say he is a professional noisemaker as he takes to the Internet with a full arsenal of voices, impressions and incredible beatbox loops. Beatboxing is a form of vocal percussion primarily involving the art of mimicking drum beats using one’s mouth, lips, tongue, and voice. Vincent is a popular and beloved Vine star. Ana Flores is the founder and CEO of #WeAllGrow Summit and Latino Bloggers Connect (LBC), the first and largest network of digital Latina influencers in the United States. She is the author and founder of Spanglish Baby and co-author of Bilingual is Better. She shares more of her personal life and insights as a Latina mom and entrepreneur on her personal blog, MadreVida.com. In 2015, the prestigious Holmes Report named her among their 2015 Innovator 25, as someone who is shaping what influence and engagement will look like tomorrow. David Lopez is a content creator specializing in short-form comedic video. He has gained more than 6.4 million followers since displaying his creative characters and slapstick humor on Twitter’s video-sharing mobile application, Vine. David is also the creator of Soccer Dads on Lorne Michaels’ digital network, “Mas Mejor” that features comedy created for Latino millennials. He has experienced a fan/follower engagement of over three billion loops (views.) He is listed as #21 in terms of worldwide following on CollabCreators’ RankZoo.com, his Facebook recently surpassed 1M Likes. “Latino Thought Makers will be off the charts with these digital giants,” stated Najera, who doubles as Oxnard College Institute for Latino Performing Arts Creative Director and host of the Latino Thought Makers Series. Oxnard College Institute for Latino Performing Arts presents the Latino Thought Makers Series hosted by Rick Najera with special guests Vincent Marcus, Ana Flores and David Lopez on Wednesday, April 13th, doors open at 6:30pm, show starts at 7pm at Oxnard College Performing Arts Center, 4000 S. Rose Ave, Oxnard, CA 93033. Entrance and parking are free. A $5 donation is suggested to benefit the Oxnard College Foundation supporting students in the arts. View a clip of Latino Thought Makers HERE.